In fishkeeping, there are typically three zones to consider when stocking your tank to ensure you have an even spread of fish: there’s surface feeders, mid water fish and bottom feeders. Bottom feeder fish live and feed off the bottom section of an aquarium. Which bottom feeders are small and easy to keep? We’re going to take a look at five of the most common bottom feeder fish, and discuss their appearance, behavior, dietary needs and tank conditions. This article on bottom dwelling aquarium fish is a guest post by Robert from Fishkeepingworld.com, an aquarium website dedicated to educating fishkeepers all over the world. Thank you Robert! What is a bottom feeder fish? underside which is useful for resting on the bed of aquariums. One thing most of them share is their ability to help keep the bottom of an aquarium clean, due to their downward pointing mouths. That’s why bottom feeder fish are often known as ‘The Clean Up Crew.’ There are some whose mouths point upwards though too. Some bottom feeders are detritivores, meaning their diet is made up of decomposing plant and animal matter. Others are carnivores that feed on other animals. Some bottom feeders grow too large for most regular home aquarium set-ups. An example of this is the Common Pleco, even though it is regularly sold in fish stores. For this reason, we’ll focus only on smaller bottom dwelling fish suitable for the average home aquarium setup. We mentioned briefly above that although fish stores usually sell the Common Pleco, which looks very cute at only 5-10cm in the store, they can quickly grow to 50cm long which is way too big for regular setups. Another option is the Bristlenose Pleco (Ancistrus sp.). It’s in the same family (Loricariidae) but only grows up to 4.5 inches. Bristlenose Plecos come in a variety of colors, the most popular being brown with patches of lighter areas. The mouth has short whisker-type appendages which are useful for finding food. 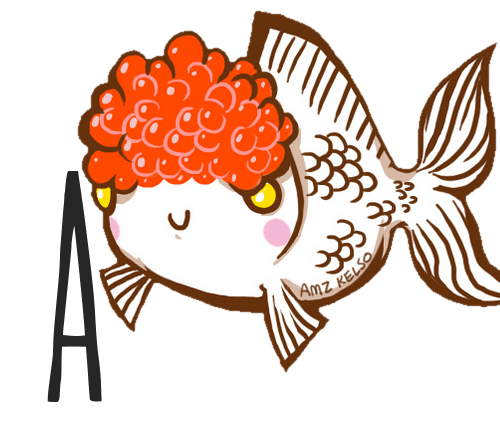 This is a peaceful fish that is pretty easy to care for. It requires an omnivorous diet; it’s not a picky eater and will pick up all the leftover food from the aquarium. You can supplement with sinking pellets and algae wafers. As for tank conditions, these Plecos will require a minimum tank size of 30 gallons. Provide them with plenty of hiding spaces, using plants and rocks. 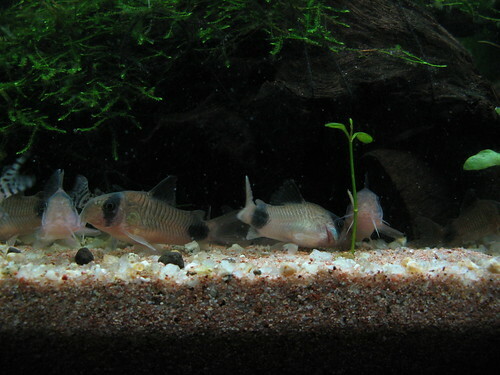 The Peppered Cory Catfish (Corydoras paleatus, pictured at the top) grows to around 2.5 inches. It has black and green spots and a white underside. Again, this is a peaceful and easy to care for fish that’s suitable for beginners. Keep them in groups of six or more to see them thrive. Peppered Corydoras require an omnivorous diet, and therefore will need both plant and animal matter. You can feed them freeze-dried bloodworms, sinking pellets and live foods. They require a minimum 10 gallon tank, which should be well-planted with plenty of hiding spaces like coconut caves so they can get away from the light. 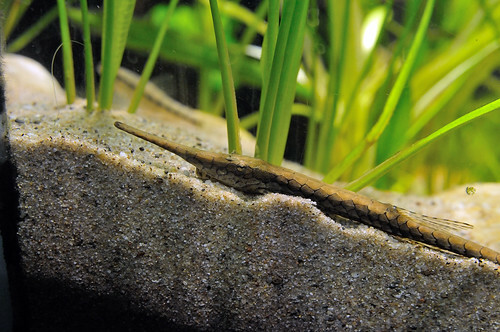 For the substrate, choose sand or very fine gravel so their barbels don’t get damaged. There are so many different loaches suitable for home aquariums and they come in a wide variety of shapes and sizes. Some loaches, like the large clown loach, require moderate care and are more suited to experienced aquarists. For that reason we’ve chosen one which is easier to care for and more suitable for beginners. 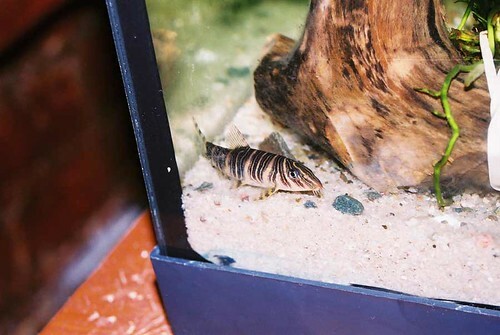 One of the gentler loaches is the Zebra loach (Botia striata). This species grows to a similar size as most other community fish (around 3.5 inches) and makes an ideal community tank mate. As you would expect, given its name, it has a black and white stripy color, with translucent fins and tail. You should feed the zebra loach sinking catfish pellets as well as a a variety of frozen foods such as brine shrimp and daphnia. They should be kept in a minimum tank size of 20 gallons, with soft substrate so as not to irritate their barbels. Include plenty of hiding spaces using driftwood, rocks and caves. The Otocinclus (Otocinclus sp.) usually does best in groups of at least 6. It is one of the smallest fish in the catfish family (Loricariidae). It has a black peppered body and grows to around 4 inches. They have a peaceful temperament, but are unfortunately not the easiest fish to care for due to their specific diet: Otocinclus are herbivores and so require a diet of plant matter, vegetables and algae wafers. They are one of the most well-known algae eaters and they will use their sucker mouth to clean rocks, glass and all the surfaces in your aquarium. Otocinclus require a minimum 10 gallon densely planted tanks, with plenty of rocks and driftwood for hiding. They’ll also need a fine substrate, with a good filtration system and high aeration. Want to know more about keeping Otocinclus in your own aquarium? You can find a full caresheet here. 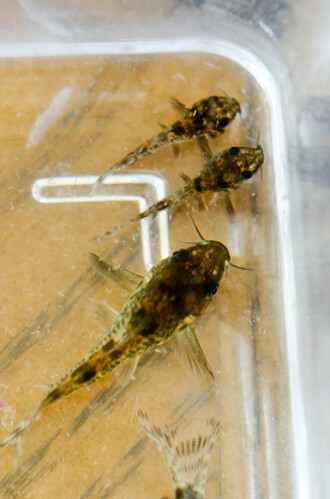 The Twig Catfish (Farlowella sp.) are one of the larger fish to feature in this article. They typically grow to around 6 inches. Their name is derived from their ability to camouflage in the wild: these fish look like twigs. They’re very long and thin, with an elongated nose and black and brown coloration. They are fairly easy to care for and make peaceful community fish. Twig catfish are omnivores, so their diet should consist of algae as well as bloodworms and frozen foods. They will get most of their nutrition from leftover food and algae, but always be sure to keep an eye on them to make sure they’re eating enough. They require a minimum tank size of 50 gallons. The aquarium should be planted and have plenty of rocks and driftwood. They also require high aeration. In search of a bottom dweller for your brackish aquarium? The appropriately named striped bumblebee goby might be the fish you need. This tiny goby is suitable for small aquariums and, with the right care, can be a real joy to keep. The most important thing to keep in mind about bumblebee gobies is that in most cases they’re best off in a single-species set-up with at least 6 of their own species. They can be relatively shy and might not always be able to compete for food with their tankmates. 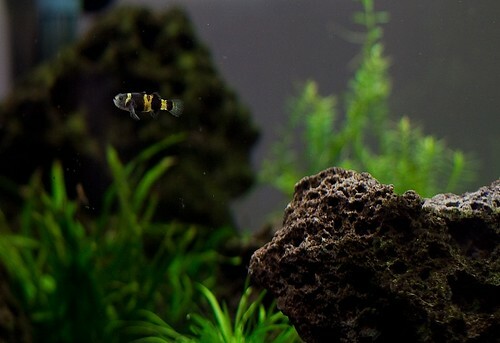 Keep your bumblebee gobies in a low-end brackish aquarium with a sandy substrate. Provide plenty of hiding places in the form of caves and tubes. Happy bumblebees will display fascinating behavior: you’ll always see them squabbling over territory and chasing each other around, though no one actually gets hurt. Want to learn more about keeping bumblebee gobies from the Brachygobius genus in your aquarium? Have a look at the full bumblebee goby caresheet. Bottom dwellers are usually great at cleaning up bits of algae and uneaten food that has been missed by the other fish. However, they usually can’t solely survive off left over pieces and you should make sure to provide them with specific foods such as sinking pellets to ensure their diet is being fully satisfied. Bottom dwelling fish can add color and personality into your tank, and give life to the bottom section of your tank. Always carry out plenty of research into each species before you add them to your aquarium – make sure they will get on well with the fish you already have and check that they won’t outgrow the tank. If you have any more questions about these bottom feeder fish or want to share your own experiences with one of the species on the list, don’t hesitate to leave a comment below! My Bristlenose Plecos have bred two baby plecos, and they are growing fast. What to do? I don’t really want four (or more) mouse-sized creatures moving around at the bottom of the tank! Hope that helps, good luck with them! I gotta say, my favorite is the kuhli loach. It’s fun to watch them squiggle around and interact with each other as well and hanging on java ferns and moss popping their heads out. Thanks, I’ll check the store. I’m not on Facebook though. providing algae wafers for them to hide under to get away from the light! Hah, yeah, thanks for the heads up! I changed it back to what it was supposed to be – coconut caves. Way more suitable for hiding purposes.